Why yes, I did flush a toilet with an avocado slicer. | spifftacular. Why yes, I did flush a toilet with an avocado slicer. Step 1: Remove toilet lid and investigate. A chain, which is probably supposed to be attached to something, has broken in half and isn’t attached to anything. Step 2: Frantically google phrases like “toilet won’t flush!” and “toilet chain broke!” Learn that the thing the chain is supposed to be attached to is the “flapper valve” (the circular, yellowish thing in the center of the tank, as shown above). Step 4: While waiting for plumber, learn from an online tutorial that I could actually flush the toilet without fixing the chain. You simply plunge your hand into the toilet tank and lift up the rubber flapper valve by hand. However, I took issue with the whole hand-in-toilet-tank-water thing. In defense of the toilet tank, this tutorial claims that “the tank contains clean, uncontaminated water” and assures readers, “Don’t worry about the brown sediment on the bottom of the tank, it’s minerals that have precipitated out of the water over the years.” As credible as that may sound, there was no way I was going to plunge my hand into that tank, sediment or not. I am kind of a germophobe like that. I needed a tool. But what could I use? Anything used in toilet-tank-plunging would be rendered somewhat unusable, so it would have to be something that wasn’t terribly important. I searched the kitchen, and in desperation I even considered using a spatula. But then I saw it: the avocado slicer. We got it as a wedding gift, and gracious a gift as it was, Dave and I simply haven’t used it–neither of us are big avocado fans. 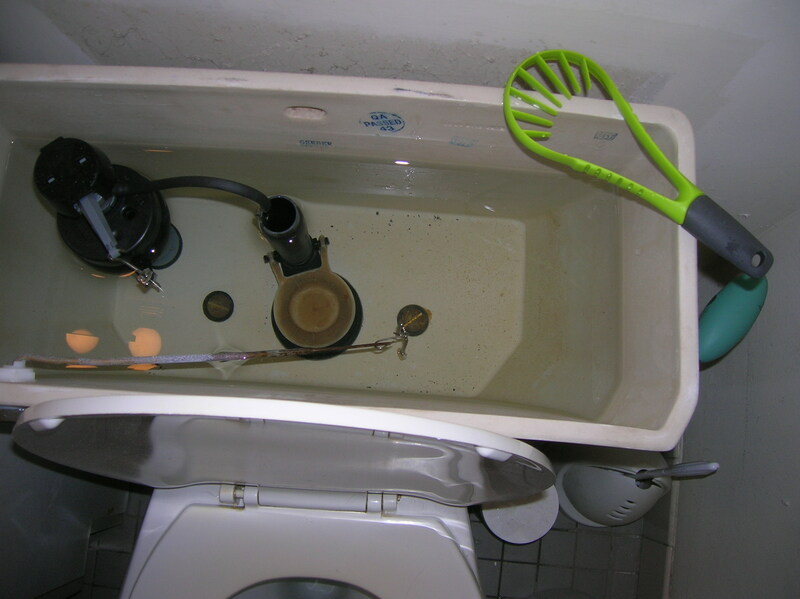 Step 5: Use avocado slicer to lift up flapper valve and successfully flush toilet. As a result, the avocado slicer’s life was filled with purpose (though perhaps not dignity), and I didn’t have to get my hands in toilet water. Victory. Step 6: Let plumber fix toilet. It’s times like this that I really, really love Google, and the Internet, and eHow, and random strangers who are willing to address totally random but everyday crises like a broken toilet chain. I am also really, really grateful for a certain avocado slicer that now resides next to our plunger and toilet scrubber.